If you have chapped lips that are dry and cracked, then consider the comfort of using EOS. The small lip balms can provide the hydration that your lips need at any time of the day and for hours at a time. The packaging is attractive to look at as well. Each lip balm comes in a round container that matches the color of the flavor of the balm inside. 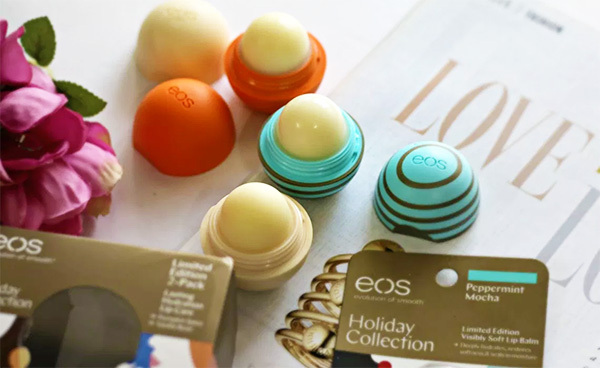 The latest EOS lip balm review reveals that there is a new collection for the holiday season that includes flavors that are delightful to taste and smell. EOS is known for crafting lip balms with natural ingredients. They are also made with organic oils and vitamin E to make your lips feel smooth and healthy. Shea butter is another ingredient used in each lip balm to keep lips soft and moisturized. There are two limited edition EOS lip balm sets that are featured for the holiday season. One collection includes peppermint mocha while the other features pumpkin spice and vanilla bean. The EOS lip balm containers stay true to the unique design of the product. The small round balls of lip balm come in containers that are green and brown, orange, and white to match the colors of the flavors. Each container comes in a clear plastic package that has been updated with a modern look for the holiday season. These lip balm spheres gently hydrate your lips without leaving them oily. They also add shine to your lips and a shimmering appearance so that it looks like you’re wearing a gloss instead of a lip balm. While wearing the lip balm, your lips will feel soft from the shea and cocoa butters that are used. There are antioxidants in each lip balm as well as vitamins C and E. Each lip balm is hypoallergenic, making the product safe for use by almost anyone. Peppermint mocha comes in a container that is designed with green and brown stripes. It seems to have a small amount more of the cocoa butter since it has a mocha flavor. As soon as you open the container, you can smell the peppermint with a delightful chocolate scent coming close behind. This is a combination that often feels better on the lips than some of the plain mint flavors because the mocha cuts down on the mint taste. There is a duo set for the holiday season as well. This set includes the pumpkin spice and the vanilla bean. The pumpkin is in an orange sphere while the vanilla is in a white sphere. When you open the pumpkin, you get just a hint of cinnamon and other spices along with the pumpkin. The vanilla bean has a mild aroma that is almost like a scoop of vanilla ice cream. The subtle tastes are delightful on your lips while protecting them from the wind and colder temperatures of the winter season. The oils give your lips a soft feeling whether it’s day or night. Each lip balm is small enough to keep in any bag or small enough to put in any stocking for the holiday season.